Jim Booley didn’t come home from the first World war. Seventy years later his sister Jean started into tears when asked what happened to Jim. She fetched a handkerchief and drying her eyes turned and put the kettle on. ‘I was just a little girl’ she said plaintively. Jean sat with her tea cupped in her hands, Jim’s final visit to the family home brought fresh to mind. Jim had his 28th birthday in the War fields of France. Then he was reported as missing, in action during a bloody battle near Suvla Bay at Gallipoli. It took a Court of Inquiry to determine he was dead, as Jim’s body wasn’t recovered. Nan’s family wrote to Army officials, pleading for information on Jim’s whereabouts but answers were slow coming. 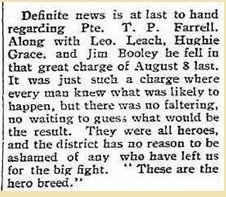 Extract from the Ouyen Mail 28 Jul 1915, source: TROVE, NLA. Three of Nan’s brothers went to war, along with their Booley cousins, and second-cousins too. They were mostly in their early 20’s and from the Mallee country: farmers, railway workers and labourers from Ouyen, Warracknabeal and Woomelong. 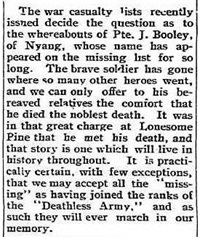 Nan’s parents, Walter Scott and Mary Jane Booley lived at Nyang and renamed their farm ‘Lone Pine’ where Jim last was. Towards war end they moved to Ballarat with their remaining son and daughters, waiting till the soldier sons made it home, to help get the farm back on it’s feet. 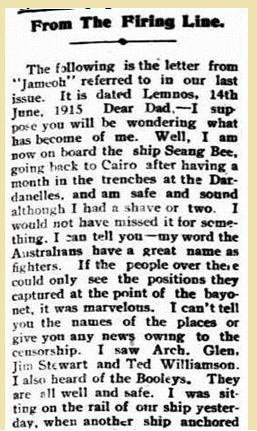 Extract from Ouyen Mail, 28 July 1918, source TROVE, NLA. Jim Booley was the eldest of Nan’s brothers but he wasn’t first to join up. His younger brother Lieutenant Stanley Booley joined on the 14th of September 1914 . ‘A good practical man but not good on paper,’ an army official wrote after War’s end. At 23 years of age Stan went into the 14th Battalion, which Jim would join two months later. Stan’s ship departed for overseas on the 22nd Dec 1914 and Jim left on the 19th February 1915 aboard H.M.A.T Runic. Their second-cousin George Booley was just shy of his 25th birthday when he had signed up in October 1914, serving as Lance Corporal in the 5th Battalion, 2nd Platoon. Henry Booley, George’s 21yo brother went next, signing up three weeks after Stan. He went as Trooper in the 4th Light Horse, 19th Reinforcements. He returned home ill ten months later, but returned again, as a private in the 5th Battalion. Extract from Ouyen Mail, 14th May 1916. Source: TROVE, NLA. Cecil Gordon Booley, little brother of Jim and Stan joined up in June 1915 just two months short of his 22nd birthday, and went as Driver for the 1st Australian Motor Transport company. Cousin Joseph Fletcher Booley aged 21 1/2, of Gheringhap had signed up just previous into the 58th Battalion,3rd Rifle division. Extract from the Ouyen Mail, 19th Sept.1917. Source: TROVE, NLA. 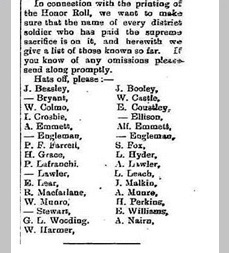 Both Stan and Jim Booley served at Gallipoli and Jim is there still, having lost his life on the 8th of August 1915 at Suvla Bay on the Gallipoli Peninsula. Frederick Walter Janes, ‘a cousin of Jim Booley’came across Jim’s body and recovered his dogtags to send home. But Fred was ‘frightfully wounded’ that day and died soon after. Neither of their deaths was determined until a Court of Inquiry on the 28th April 1916 and neither of their bodies were recovered. Extract from the Ouyen Mail, 9th Aug 1916. Source: TROVE, NLA. Fred Janes had joined the 14th Battalion on the 17th September 1914, a 21 year old farmer from Coburg in Melbourne. He sailed overseas on the Ulyses on the 22nd December. A couple of weeks after his death Fred’s father received an official notification that Fred had been wounded though ‘not serious’. Surving fellow 14th Battalion members gave evidence at the Court of Inquiry. Private W. J. Taylor, service number #1645 and of 41 Bosisto Street Richmond, Victoria said he and Jim Booley had charged together for Hill 971 on Sunday 8th of August. They parted company on the retirement and though Taylor looked for Jim he found no trace of him. The country they were operating in was ‘very scrubby and hilly’ which another witness said was at ‘Australia Gully towards Suvla Bay’. Private Taylor said when he heard Jim had been hit he searched for Jim in the dressing stations without success and the Chaplain also conducted searches for Jim. Private J. G Bond #1580 was from Burkes Flat at Beailiba, Victoria. Bond said Jim made for Hill 971 at 3 a.m as day was breaking. He saw Jim go into the attack, but they were pushed back and Jim did not turn up after. Jim ‘came from a placed pronounced 0-eean,’ Bond said in his official declaration. Private W.H.Gunn # 867 said he had known Jim who he thought was from Warracknabeal, and that Jim was with Lt. Warren in a charge at Suvla Bay on Aug 8. 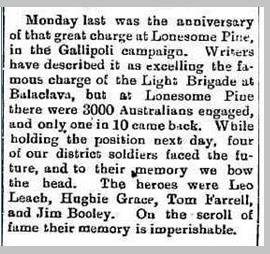 Jim Booley was shot and died immediately he said, and Gunn and his mates ‘talked about it on the way back to the trenches’. Arthur Clive Buckler #813 from 32 Gladstone Street, Moonee Ponds said the day after Jim’s death he was told by Fred Janes ‘of my own Company and a cousin of J. Booley’ that he had taken his cousin’s disc and pass book off his dead body. ‘Fred Janes was afterwards frightfully wounded and I think died, but cannot say for certain.’ Buckler said. The Court of Inquiry recorded simply that Fred Janes was “Killed in action 8.8.1915. No Burial”. His personal effects were returned to his father per Borda on the 22nd Sept 1916, probably those handed to a mate for safekeeping.Jim Booley’s dog tags were not mentioned in the list of Fred’s belongings and the Red Cross was still conducting a search for Fred’s body in October in 1919. Thirteen days after Jim Booley’s death his brother Stan went to hospital with gunshot wounds to the arm. It was the first of three wounds he received in his five years of service: shuffled off to camp hospitals or Malta or England only to be sent back to fight on. After 1000 days of war service Stan had still not had a break – ‘A good practical man but not good on paper’. 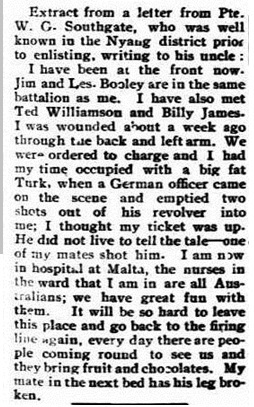 George Booley was hit by bullets on the first day of the Anzac Landing April 25th 1915. He was sent from hospital back to his unit just three months later. George was twice nominated for service commendations. Henry Booley was commended three times, receiving a military medal for his bravery under fire. “During the attack on St Martin’s Wood, near Foucaucourt, on 23rd Aug.1918, Pte BOOLEY did valuable work as linesman. He continuously patrolled and mended the lines to forward companies under very heavy artillery fire. He showed an utter disregard for personal safety at all times and carried out his duty till finally overcome by gas.”. 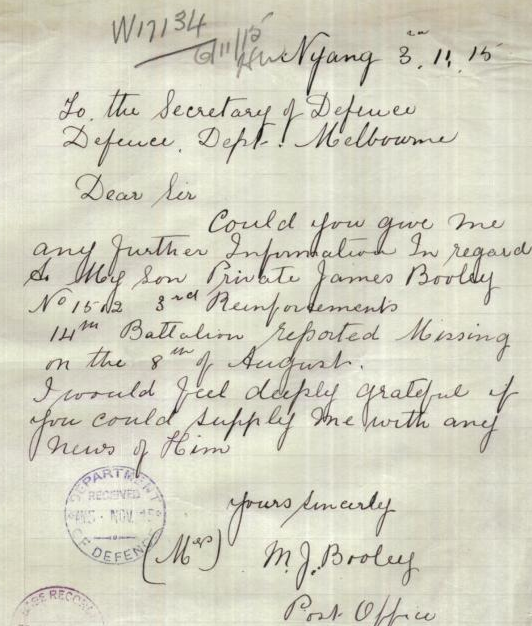 (extract from the Service Records of Henry Booley, National Archives of Australia). ‘During an intense bombardment a shell burst alongside private Booley and buried him. He left the forward area in a seemingly bad state,’. Joe suffered excruciating pain in his spine from the shell that burst on a parapet two yards away from him. He remembered being buried alive then fellow soldiers digging him out, before he ‘lost himself’. He was sent eventually to England for treatment for shellshock and then home to Australia. 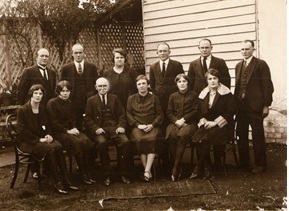 Family Photo of Walter Scott Booley (seated, third left) and sons and daughters. My grandmother Jean Booley is seated second left. You will be wondering who this is from, so I had better explain at once. I am a lance-corporal in the signal section, to which your son was attached, and it is about him I am writing. You have no doubt been notified by the Defence department that he is reported missing, and I will try and tell you as much as possible about it, but I hope by this you receive thisyou will have been notified that he is a prisoner, that being the only hope we can hold out for him. I suppose that George had written to you telling you that he was going out on a raid on the German trenches. Volunteers were asked for. All of our section volounteered, and the names were drawn. George pleaded so hard to be allowed to go that at last they gave in, and let him. Even the colonel was against his going, as he was his favourite runner, and if he had any special job on he would always ask for him. However, he gave in and said he could go. It came off on February 10, and all hands went off feeling very confident. George stuck to the officer until the time came for him to run along the trench and tell the raiding party to return to their own trench, he having to go one way and the other runner the opposite. The other one got back safely, but although the officer said that he left the trench with him, no-one has seen or heard of him since. That is all I can tell you as to what happened to him, but I can tell you that your lad was considered by the lads to be one of the heroes of this war and had he got back safely we all expected him to get a decoration. He was a brave lad, and a general favourite with all. You must accept the deepest sympathy of all in your trouble. “Cecil G.H.Booley, No 3010, 10th Reinforcements, 8th Battalion, Abbassia, Egypt. It gives me great pleasure to be writing you these few lines. Christmas billies were given out to our battalion yesterday, and I was the recipient of the billy sent by you. It was a very nice sight to see our boys (who were very pleased) marching up and each getting a billy in turn. It is the main thing that the men look for here – something from home or from their friends in Australia. There are large numbers of men here now. They have withdrawn the troops from Gallipolli. There was a sports meeting held here yesterday and there were some really good prizes given for the different events. We have a stadium here, and have concerts occasionally, and when it is all said and done we do not have a bad tie of it. Thanking you very much for the billy, and with kindest regards, yours, etc.”.